What is the currency of Papua New Guinea and its value against other major currencies? Papua New Guinea’s unit of currency is the Kina, which is divided into 100 toea (pronounced ‘toya’). What is the population of Papua New Guinea? Approximately 8 million people live in Papua New Guinea. What is the capital of Papua New Guinea and how many people live there? Port Moresby is the capital of Papua New Guinea. Its population of 800,000 people represents most of the provincial groups that make up Papua New Guinea. With temperatures averaging between 30°C and 34°C, the country is hot most of the year. Coastal regions have a tropical climate and the Highland areas have cooler weather in the evening. The driest seasons are May to October with the southern coastal areas (including the capital, Port Moresby) enjoying the best of the dry weather. How many languages are spoken in Papua New Guinea? The country has over 800 distinct language groups, however English is widely spoken and recognised as the official language of the business and government community. “Pidgin” or Neo Melanesian is also widely spoken but more predominantly on the New Guinea side of the country. Originally introduced as a trade language between the locals and German colonists, PNG Pidgin includes words from the German language but most words are derived from English. On the southern coast of Papua New Guinea, Motu is spoken as well as a modified version called Police Motu. What are the main attractions in the capital, Port Moresby? What are the banking hours in Papua New Guinea? ATMs are located in or near bank branches in Port Moresby and at all major centres. Many hotels in Port Moresby and major ports also have ATMs, however it’s advisable to check whether there is an ATM available at your destination before you arrive. ATMs accept Visa and most major credit cards for cash transactions. Operating hours are generally from 7:00am to 7:00pm. What major currencies and credit cards are accepted in Papua New Guinea? Most major currencies are accepted at banks in Papua New Guinea including USD, AUD, NZD, SGD, PHP, JPY, HKD, CAD, DEM, GBP and FRF. Major credit cards are accepted including American Express, Visa, Mastercard and Diners. Credit card payments are accepted for payment of hotel bills, rental cars, airline tickets, tours (with major tour operators only) and at some specialty retail outlets. Department stores usually open from 8:00am to 7:00pm. A few of the larger department stores in Port Moresby close between 8pm and 9pm. In smaller centres these hours may vary. Do Papua New Guineans have their own culture or have they adopted Western culture as a result of Christianity? 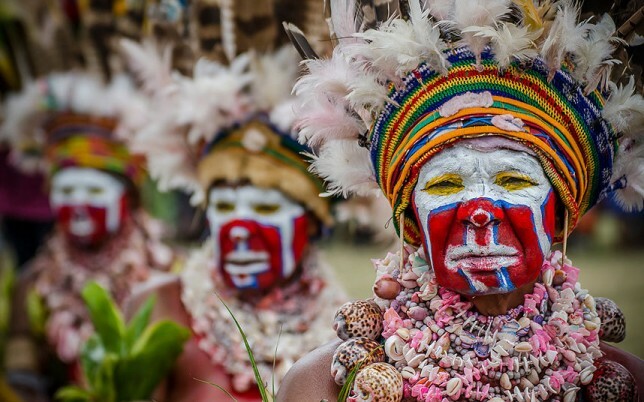 Papua New Guineans are fiercely proud of their respective cultures. However there is a strong Western influence on some aspects of their culture such as dress. These days full traditional finery is only worn on special occasions such as bride price ceremonies, wedding feasts or at cultural shows.